I had read about it before and Operation Babe Hunt was the only reason I finished the game. I wanted to see for myself how horrible it really was. In the middle of the game there is a segment where everyone goes to the beach and one of the characters (Junpei) wants to go hit on women at the beach. The entire scene is supposed to be funny and it’s actually quite short. Maybe that’s why I didn’t find it difficult like the scenes from P4 but more annoying. It’s more a feeling of frustration with the existence of the stereotypes that they are re-enforcing. I am not trying to tell developers what to do, but if you are going to have trans characters, something other than the same negative cliche’s would be nice. Here’s what happens in the scene: the boys run around hitting on random groups of girls. Of course, they only meet comic failure. Only not quite humorous. The only woman who responds positively to their advancements was the trans woman. That’s where the stereotype painting trans women as sexual deviants/predators comes in. Other than that, they also use a question mark in the name “Beautiful Lady?” which is offensive. But like I said the scene went by quickly and within the game it was more of a nuisance. 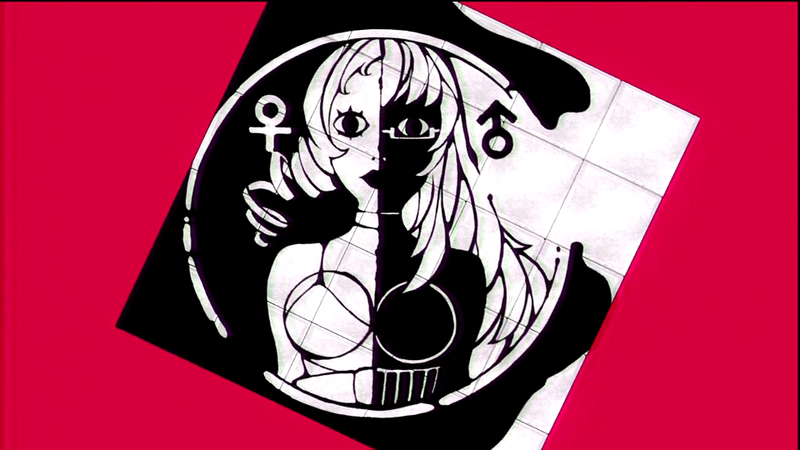 It’s just another example of Atlus poorly portraying trans characters. It’s the same type of quick joke that has been done before and likely will be done more. Though, I admit Atlus does seem to be improving with their trans characters. I wouldn’t mind seeing how much they can improve. They make good RPGs and great characters. I saw a girl. I knew right away. She’s the tank they were just mentioning a few scenes back. “OMG, She’s the Tank,” I proclaimed. She instantly became my favorite character of the game. Her name is Aigis and (Spoilers) she is a robot made for killing shadows. As I’ve said before, I love AIs. For me the prospect of playing out a relationship with a robot was exciting. It drew me in, immediately. Unfortunately, the game makes you wait a long time before you can experience it. 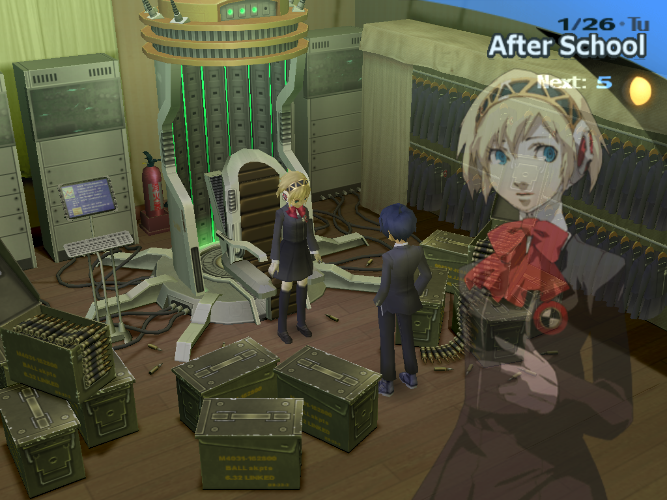 Much of the story for Aigis revolves around her trying to understand what it means to “live” and trying to live. There isn’t any profound revelations from her unless I’ve overlooked something(actually entirely possible). She realizes that she wants to protect you, the main character, and that she loves you. Toward the end of her story she asks you to touch a delicate component that lies at the base of the neck, behind her bow. She tells you that it will burn some of your genetic information onto the component and then she apologizes if she makes unusual noises. The scene ends with her request, “Will you… untie my ribbon?” It is a very intimate moment even though nothing is shown. It was a beautiful relationship. It was made even more significant to me by the fact that I made no other effort to date any other of the characters in the game. Although, it was a different kind of relationship that I don’t think the developers intended to be used as a romantic relationship. At least maybe not the way I viewed it. Probably because of the issue of her being a robot. I assume this since the game didn’t prompt me to give her any gifts like it did with other characters. But it definitely was the most meaningful to me. I almost missed this last storyline in the game. That would have been a shame because it was one I could easily relate to. I thank my friend for pointing out this social link. Early in the game one of the characters gives you an MMO game to play. For a while I didn’t realize how to play it but near the end of the game I realized I had just overlooked it. You enter the game and are greeted by a girl. You interact with her through the game and she begins complaining about work. After a while you can really feel a closeness. The two seem to care more about each other than the game. One day you get a note that the server is shutting down because there aren’t enough people. At this point I think it’s just you and her. This is a sad thing to me. It’s an end. That is enough to start to be sad but then you wonder what will happen to the relationship and it’s even sadder. The girl, Maya, devises a strategy to send the company your chat logs so they can see how important the game is to you. Then the sad parts happen. She changes her mind. The chat logs make her want to refocus her life and she leaves, forever, before the servers even shut down. No exchange of information. No “see you later”. Just, goodbye. But she leaves you a note. She tells you to take a screenshot of it for your phone after she leaves. Then she’s gone. Her note reads, “I LUV U”. Maybe it’s because of who I am, but it’s one of the sadder things I’ve ever read. Anyone who reads my blog probably knows, I don’t have many RL friends. So, the bonds I make online are very important to me. I care about all my online friends very much. I am grateful for having them. It is a scary thought that they could disappear like that. I went back to my computer several times to see if it would let me try to talk to Maya again. It did not. And I cried (though I had also been depressed at the time). There is hope however. The girl reveals enough information that you figure out who she is IRL. You don’t get to interact with her until the end of the game. She discovers who you are and starts to freak out. She feels bad for telling you all the things she did. Then she asks you to dinner but runs away. My friend said that the scene was funny but I just felt the loneliness that I feel everyday. I feel like something is slipping away from the characters and they are just standing there letting it. It’s an empty feeling for me. 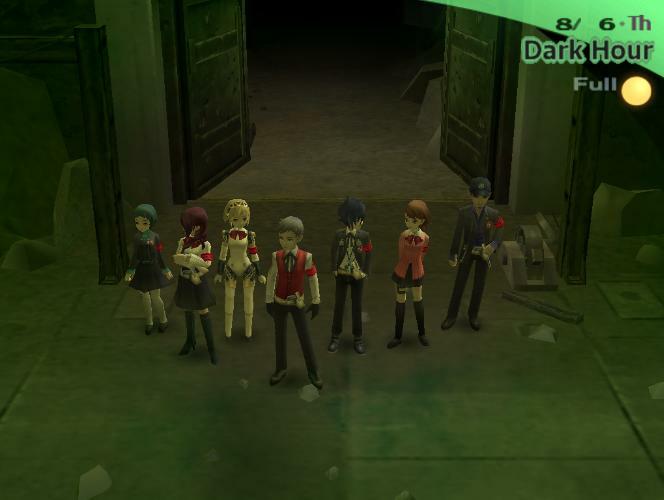 P3, much like P4 which I’ve already reviewed, is a very well crafted RPG. The music is fantastic. The Visuals look nice. The characters are endearing. It starts off very slowly, much like P4, although the characters early on feel weak. None of the social links you can make are very interesting, so even though the game opens right away, it still feels restricting. Once more characters start to be added the game really starts to take off. You get more social links that you actually want to see through to the end, including 2 that I mentioned above. The game also has an intense story with many unexpected surprises. It would be difficult for me to choose a favorite between P3 and P4. I liked them both despite each having some things that bothered me. This game also has become one of the only few games that have made me cry. It is a great journey and I think you should experience it.